The recent Pulpwood Girlfriend’s Weekend in Jefferson Texas was a fundraiser for Contory’s literacy efforts. 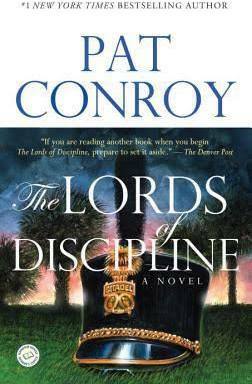 This event revived my interest in Conroy’s writing, so I decided to read again his Lord’s of Discipline. Why? Perhaps because I once lived in Charleston (James Island actually) and loved the city of Charleston and the whole area. I’ve often said it was my favorite city in the whole world. The history, culture, geography and legends have always amazed and intrigued me. While living there, I befriended some Citadel cadets and was able to visit the Citadel a few times. As I reflected on my friends, I wondered how that elite military college affected them. I decided to read the novel again and collect some thoughts on my reading. I purposely decided to not read any reviews; I just wanted to have a reader’s response to the novel. The themes I discovered in the novel on friendship, the cruelty of men (and women), the power and pain of first love, the changing nature of memory, and the abuse of power were moving and sometimes disturbing. The old ragged paperback I read is now marked and underlined and Conroy’s vocabulary is an education in itself. I learned so much more than I intended, and that to me is a sign of a powerful book. Some of the unforgettable lines on this read are: “I was young then, and my youth permitted me to believe I could change the world if only I could devise a cnning enough strategy” (211). “Beautiful cities have a treacherous nature” (241). “Great teachers had great personalities and that the greatest teachers had outrageous personalities” (271). “The objects you valued defined you” (336). There were so many good sentences and well-turned phrases from this very Southern writer. HERE iis a video of Conroy briefly discussing The Lords of Discipline.